In 1955, Herald and Miriam Smith started Cedar Rapids Steel Transport out of a refurbished chicken coop they bought for $125. At the time, they had no trucks and no customers, but Herald, known as "Smitty," convinced firms he could save them money. He contracted with owner/operators who were hauling livestock to Chicago to return to the Cedar Rapids area with loads of steel instead of empty trucks. Family owned to this day, CRST has evolved from a trucking firm to one of the nation's leading providers of transportation solutions. The training at CRST will last approximately 8 weeks. CDL training will last from 2 to 4 weeks depending on the school you attend. That will be followed by a 4 day orientation session at a CRST terminal and a minimum of 28 days and 14,000 miles with a company trainer. You will average approximately $550 per week during your training. Training pay is up to $.32 for the first two months, up to $.35 from 3-5 months, and up to $.41 from 6-11. At CRST you will run team after training. 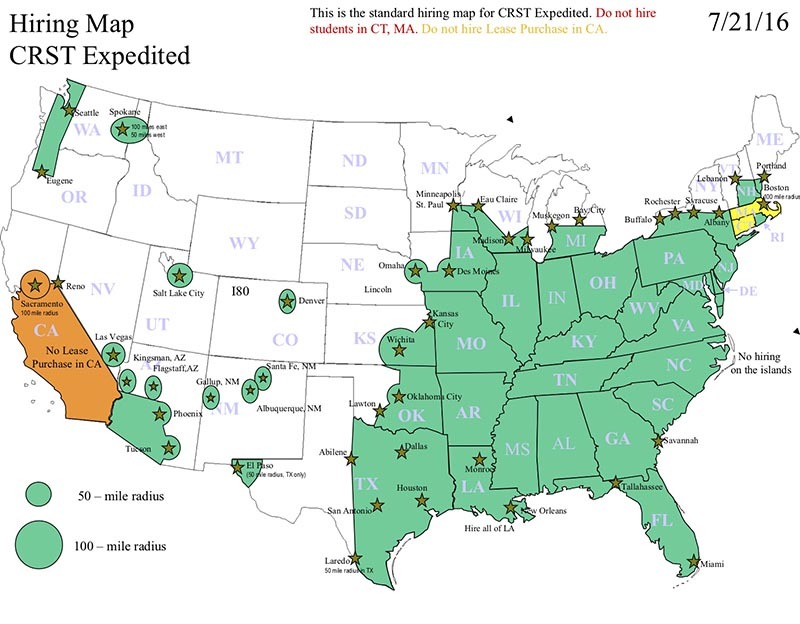 CRST runs almost exclusively with teams. Must be at least 21 years old and pass a DMV/D.O.T. (Dept of Transportation) physical and a pre-employment drug screen. You must have a good driving record and have been licensed in the United States for a minimum of 2 years out of the last 3 YEARS. No DUI, DWI, or open container violations in the last 5 years. No more than 1 DUI in the last 15 years and no more than 2 DUI's in your lifetime. CRST does not allow anyone to ride along. CRST does not allow pets. Active Military Reservists and Honorably Discharged Veterans receive a $500 bonus on top of any other bonus offered at CRST. CRST is approved to honor your G.I. Bill benefits through the V.A., and also provides credit towards your pay for your previous Military service.